IDENTA LC Nano-Ceramic Restorative Flow is a flowable, light-curing (halogen and LED), radiopaque filling material suitable for filling anterior and posterior teeth. 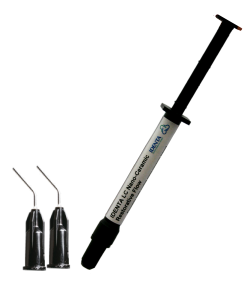 As an multifunctional methacrylate-based material, IDENTA LC Nano-Ceramic Restorative Flow represents an advancement in composite technology. Due to its low viscosity, IDENTA LC Nano-Ceramic Restorative Flow provides very good wetting and adaptation to tooth substance. IDENTA LC Nano-Ceramic Restorative Flow contains three-dimensionally curing anorganic-organic co-polymers (multifunctional methacrylates) and additive aliphatic and aromatic dimethacrylates. IDENTA LC Nano-Ceramic Restorative Flow cures under halogen or LED lights. IDENTA LC Nano-Ceramic Restorative Flow can be polished to a high gloss and exhibits high durability and color stability. IDENTA LC Nano-Ceramic Restorative Flow contains 64% anorganic filler material (=50.5%vol. microfillers, ca 0.7 µm and highly disperse silicon dioxide). IDENTA LC Nano-Ceramic Restorative Flow is available in 4 shades (A1, A2, A3, A3.5).